Hidden passages have a long history of appearing in fictional novels and films but an even richer past in reality dating back to Egyptian tombs passages for Christians to worship in hiding from Romans. Over the years hidden passages have been used to arrest kings and evacuate popes, hide shogun warriors, facilitate guerrilla fighters, enable drug smugglers and conceal serial killers. 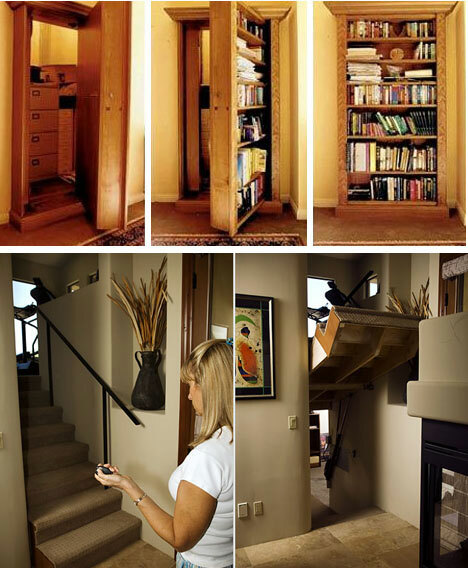 In recent times, however, many more modest individuals have created (or discovered) secret passages in ordinary everyday households and there are even companies dedicated to designing secret doors, rooms and passages in middle-class houses. In some cases the discovery of a secret room is a wonderful find but it can also be a twisted nightmare. Man of many talents, Master of none, Stud Service, Orgies Organized, Tigers Tamed, Bars Emptied, Governments Run, Revolutions Started, Uprisings Quelled, Wars Fought, Assassinations Plotted, Computers Verified, Weddings Officiated.